AUDIO INTERVIEW WITH SHARON: "EMMYS CHAMP SHARON GLESS LOVES FACING DANGER ON 'BURN NOTICE'"
Tyne will be appearing at the McCarter Theatre Centre on October 22, 2011. SHARON GLESS TO APPEAR IN "CELEBRITY AUTOBIOGRAPHY"
Sharon will be appearing at the Adrienne Arsht Center for the Performing Arts in Miami in the 2009 Drama Desk Award Winner Celebrity Autobiography ("Outrageous and true celebrity memoirs performed live on stage by some of the funniest people in entertainment"). Further details here and in the Miami Herald. CAGNEY AND LACEY IN "100 MOST MEMORABLE FEMALE TV CHARACTERS"
Both Cagney and Lacey were named in TV Squad's "100 most memorable female TV characters" list, with Mary Beth coming in at 39 andCagney at 22! Read the full list here. Read/download a new article "BURN NOTICE'S Award-Winning Sharon Gless Returns to the Stage. See why her star shines so bright" about Sharon in A Round-Heeled Woman : The Play, published in Miami Living Magazine Issue 30 Winter/Spring 2011 by Marla E Schwartz. Now on the stands, if you want a printed copy. Tyne will star on Broadway as Maria Callas in Terrence McNally's Master Class. We are very sorry to announce the death, aged 86, of Del Reisman of cardiac arrest after a brief illness. Del co-wrote the Cagney & Laceyepisode "Burn Out". You can read an obituary here. Sharon Gless will make a special appearance at the Miami Gay Men's Chorus holiday concert, Saturday, December 11th. The Academy of Television Arts and Sciences has announced that Sharon Gless has been nominated for Outstanding Supporting Actress Drama for her portrayal of Madeline Westen in Burn Notice. See more, here. Sharon will be presented with the Lesbian and Gay Police Association Gay Officers League of Chicago "Bridge to Unity" Award, and attend a special DVD release party for Hannah Free, in Chicago on June 26 2010. RAVE REVIEWS FOR TYNE DALY IN "MASTER CLASS"! Tyne has received excellent reviews for her current production, Terrence McNally's Master Class. Please see the Profiles section. Sharon will receive the 2010 Career Achievement Award at the 12th Annual Miami Gay & Lesbian Film Festival. Sharon will be presented with a Lifetime Achievement Award at the Delray Beach Film Festival on Saturday, March 27th, 2010. Sharon will be talking live to Rosie by phone on her show on Sirius Radio, on Monday, March 1st, from approximately 11:10AM to 11:45AM (Eastern time). Sirius radio is 102 and XM 9s 155. For those without access to Sirius, a recap can be found at the Rosie Recap Blog. It has just been announced that Sharon has won a Gracie Award for Individual Achievement, awarded by American Women in Radio and Television, as Outstanding Female Actor in a Supporting Role in a Drama Series (USA Network's Burn Notice). The 35th Annual Gracie Awards Gala will be held on Tuesday, May 25 2010 at the Beverly Hilton Hotel, Beverly Hills, CA. Burn Notice returns to finish its third season on Thursday, January 21st. TYNE DALY'S "SECOND TIME AROUND"
Tyne will be starring as Opera Singer Maria Callas in Terrence McNally's Nights at the Opera: Master Class. For further information, please see Tyne's 'recent and current work' pages in the Profiles section. Tyne is making a further appearance in her cabaret at Feinstein's at Loew's Regency in January. More details in her Current/Recent work section of the Profiles pages. COMPLETE CAGNEY & LACEY SERIES EPISODES AVAILABLE ON iTUNES UK! Great news for UK fans!! You can now download any or all of the 125 Cagney & Lacey episodes from the iTunes UK store. The iTunes application is available to download free for PC or Mac. Read Sharon Gless's answer to a question about the new play from fan Maggie. Now released in the US, these DVDS are available in the high street from Best Buy stores, as well as through online retailers. Beverly Hills opening on October 23, with a special appearance by Sharon at the 7:20pm opening night screening. OFFICIAL WEBSITE FOR SHARON'S NEW PLAY "A ROUND-HEELED WOMAN" GOES LIVE! You may wish to bookmark it in order to keep up to date with news of developments about Sharon's new play, which premieres in San Francisco in January 2010, and see any exciting new material which may be added! You can also blog on the site ... be the first to leave a comment! 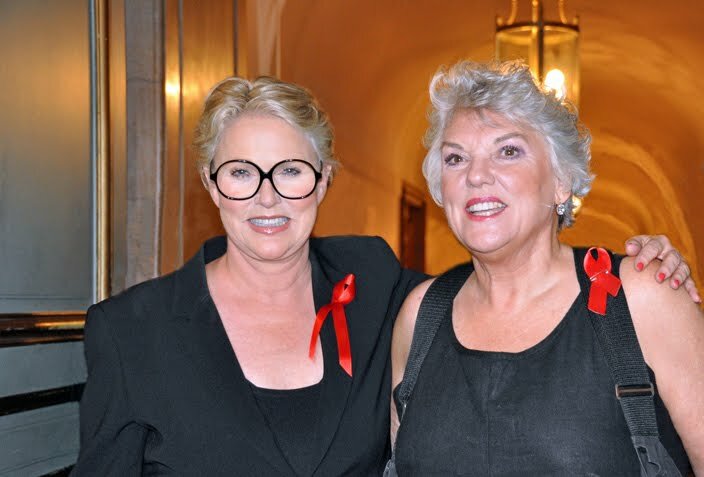 Sharon Gless to attend 26 September gala performance of Hannah Free in Chicago, the city in which it was shot. For additional screenings in more than 30 cities this fall, please see the Hannah Free website. The Theatre at which Sharon Gless will be starring in Jane Prowse's stage adaptation of Jane Juska's A Round-Heeled Woman has just been announced. You can sign up for their mailing list to be advised of news about the production and of when tickets go on sale. Tyne Daly took part in the Aids Benefit in San Francisco on 2 August, 2009. Read about the scheduled cast details. Sharon Gless put in a surprise appearance: our photo shows the women together at the benefit. Read all about it in the San Francisco Examiner. The European premiere of Hannah Free will take place on Sunday, August 2, at Gaze, the 17th Annual Dublin Lesbian and Gay Film Festival. Read a report in shewired.com on the Hannah Free Screening at the LA Outfest on Friday, 11 July 2009, which Sharon Gless attended. Tyne will participate in a reading of George Bernard Shaw's Mrs Warren's Profession. Please see the Playbill article for details. Michael Feinstein will join Tony winner Tyne Daly for an upcoming concert at the McCallum Theatre in Palm Desert, California. Daly will belt out tunes February 19, 2010. Show time is 8 PM. Tickets can be purchased through the theater box office online. Tyne will also be performing the cabaret act at the Hotel Nikko, The Rrazz Room, San Francisco, California from January 12 -17, 2010. Show at 8PM Tickets can be purchased through www.ticketweb.com. Read the article in today's San Francisco Chronicle. TYNE DALY IN "LOVE, LOSS AND WHAT I WORE"
Tyne is to appear in Nora and Delia Ephron's stage adaptation of Ilene Beckerman's book Love, Loss and What I Wore in an Off-Broadway production in the fall. Read the article in Variety. 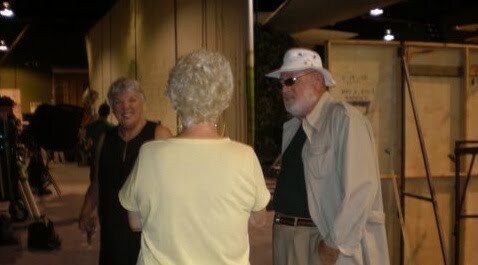 Tyne Daly flew into Miami on Tuesday, June 16th to do a two-day guest appearance on Burn Notice. The women had a ball sitting around chatting and laughing, running lines in the makeup trailer as in the “good old days” and generally behaving as really good old friends do when they see each other. Barney and I went to the studio to watch them work for old time nostalgia. I am not giving any information re Tyne’s character or storyline. You will have to tune in USA Networks in January 2010 to see the episode. We will give you advance notice on the site of the air date as soon as it’s announced. Sharon Gless will appear in a rehearsed reading of A Round-Heeled Woman on Saturday 13 June at 10.30 am, at the Richmond Theatre, Richmond, Surrey. There is a small charge for tickets, which can be booked here. Beginning June 2 at 0600 eastern time, runs through season 3 premiere on June 4. Please check for local times. Hannah Free premieres as the Gala Night Closing Film of the San Francisco Frameline Film Festival. MGM has issued a press release about the release of Cagney & Lacey Seasons 2- 3 episodes on TV.com, and an accompanying publicity tour with series stars Sharon Gless and Tyne Daly, and Executive Producer Barney Rosenzweig.